PT-175 is now also available with remote control. Remote control technology enables PT-175 to operate in dangerous conditions and on very steep slopes. 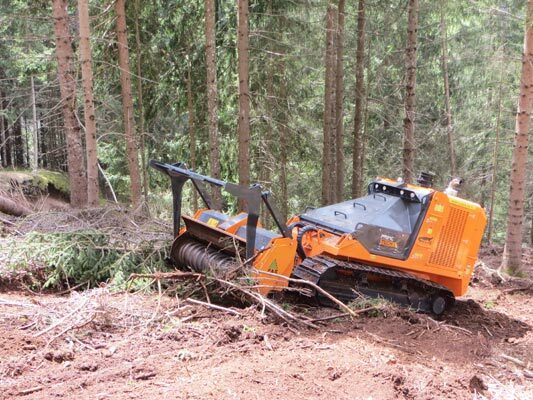 It is able to perform uphill, downhill and sideways, without putting the operator into risky and unsafe situations and avoiding an uncomfortable seating position for the operator due to continuous driving sideways on slopes and ditches. An innovative remote control ensures accurate guidance of the vehicle at a range of up to 1000 meters. All of the controls and displays the operator would normally see in the cab are on the remote-control unit too. The runtime of the batteries reaches up to 10 h. Moreover, the tilting remote control unit can be opened by a manual pump, which allows easy access and inspecting of all components located underneath. The big side doors guarantee easy access and perfect service ability; The rear part of the frame is hinged and can be opened for quick and easy cleaning and maintenance of the radiator. PT-175 is equipped with an oversized radiator, allowing the machine to operate in very hot climate with no overheating issues. The radiator comes with coarse fins, preventing it from getting plugged by dust and dirt and making cleaning much easier. As an option, the PT-175 can be equipped with a proportional (so-called variable pitch) and reversible sucker fan. 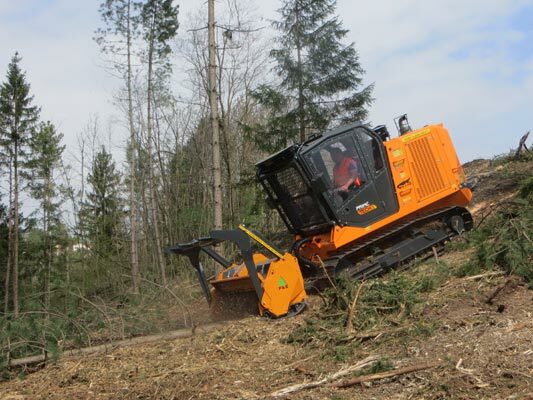 Based on radiator temperatures (coolant, intercooler and hydraulic oil) the blades will automatically adjust their position in the most efficient and effective way. This results in less power absorbed by the fan and in lower fuel consumption as well as less air and dust flow crossing the engine compartment, helping to keep it cleaner. Canopy to avoid built-up of debris and snow on engine compartment. New GPS Plus with surface mapping to monitor productivity by measuring mulched surface, overlap, etc. with an accuracy of 0-20 cm (0-8”).